Erin Jayne | DRTV Talent. Direct response television talent. Female and male talent for your direct response tv campaigns. Erinjayne’s professionalism and bubbly personality have helped her carve a successful TV career. 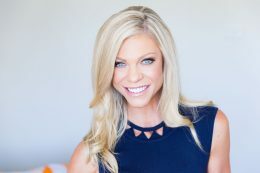 You may recognize her as ‘The Danoz Girl’ selling everything from Slim Jeans to Steam Mops over the last three years on Mornings With Kerri-Anne, The Morning Show and The Circle. She is also an accomplished presenter on Foxtel’s TVSN (Television Shopping Network) where she has presented regular live shows since her debut in 2005. In 2010 Erinjayne was Beach Reporter for Channel 10 at the Coolangatta Gold reporting race conditions and interviewing competitors during the two-hour live broadcast. 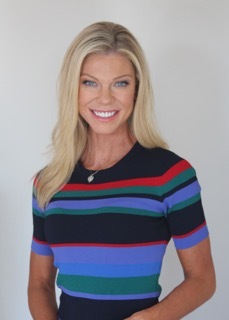 For six years Erinjayne was an Aerobics Oz Style Presenter with a worldwide audience of 40 million people viewing the show each weekday morning. She recorded hundreds of episodes and several DVDs until the show wrapped in 2006. Since then her versatility has seen her do everything from MTV Most Wanted voice-overs to hosting a TV fitness series for children titled ‘Totally Active’. Other gigs include web presenting for Clive TV (2010), appearing as a guest panelist on The Trophy Room Pilot (ABC), presenting Parramatta Leagues Promotional DVD (2005) and Infobreak advertorials (2003-current). Erinjayne has starred in countless TVCs including Subaru Imprezza, Gatorade, Sony Wega TV, Razzamatazz, The Coffee Club, Howard’s Storage World, Parklea Markets and the 1994 Commonwealth Games Campaign. Erinjayne’s career began when she was plucked from hundreds of beach goers at Manly to star in an NBC US television commercial as the ‘Face of Australia’. This Australian Tourism Commission campaign also featured her in New Idea magazine, The Sydney Morning Herald and led to her being cast on Baywatch Australia. Prior to television her background was as a print journalist having worked as Press Information Specialist for SOCOG (Aquatics) during the 2000 Olympics. Erinjayne also edited Best Buys Home Theatre magazine (1999-2001) for Horwitz Publications and freelanced for Men’s Health magazine, The Manly Daily newspaper, Gardens & Outdoor Living, Geare magazine and Domain (The Sydney Morning Herald). As a researcher Erinjayne worked on a Pilot episode of a kid’s talent show Here’s Looking At You Kid (2007) and for Channel 7 at the 1994 World Swimming Championships in Rome. Erinjayne’s interest in sport developed at a very young age winning her first state gold medal in swimming at age eight. She went on to become a synchronised swimmer and represented Australia at three World Championships as well as winning 11 national titles. She also represented Australia in surf life saving and NSW in water polo, cricket and cross-country running. As part of her diverse background Erinjayne has also worked as a magician with clients such as Tooheys and McMillan Printing. She is a trained trapeze artist and has toured with the Flying Lotahs Circus to Malaysia (2003) and New Zealand (2005). Other odd jobs include taking to the catwalk for the Australian Fashion Awards and back-up singing in a country music video clip. Erinjayne has also graced the pages of Slimming Magazine, FHM and Cosmo.